In the realm of the Earth sciences (within the cramped offices of competitive post-graduate students at least) there has always been a playful antagonism between ‘hard rock’ and ‘soft rock’ geologists. So I was certainly fraternising with the enemy when I recently caught up with a good friend, Jodi Williams, to hear about her travels south during the past summer. Jodi studied metamorphic petrology at the School of Geography, Environment and Earth Sciences at Victoria University, culminating in a thesis that probed the temperature and pressure histories locked in the geochemistry of the Alpine schist. Following university, work in the Amazon rainforest and travel through East Africa left her hungry for further adventures into the natural world. So when she had the opportunity to head deep into the untamed Southern Ocean, to explore the remote southernmost outposts of the New Zealand biogeographical region, she jumped at the chance. Heritage Expeditions is a Christchurch-based company that advocates wildlife conservation through responsible travel. The Enderby Trust provides financial aid to young people who have a passion for the natural sciences, allowing them to travel to the sub-Antarctic Islands of New Zealand and Australia with Heritage Expeditions onboard their research vessel Spirit of Enderby. The early human history of many of the islands is written in the blood of hapless penguins and marine mammals that were brutally harvested and rendered for natural oils. Native flora and fauna also struggled under the pressures placed on them by exotic species, but serious conservation efforts have been hugely successful in restoring the damaged areas to their former glory. The Snares are close to pristine, with more birds nesting on these tiny islands than there are seabirds around the entire British Isles. 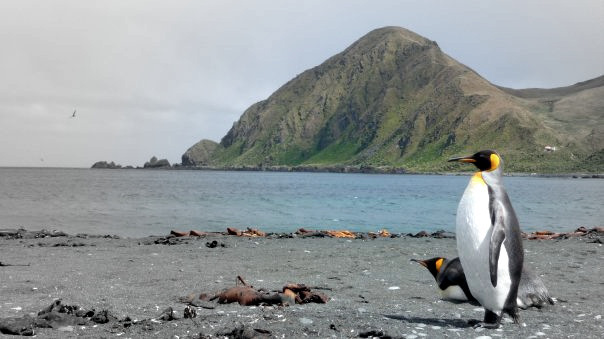 * The rich biodiversity and geological significance of the New Zealand and Australian sub-Antarctic islands respectively has earned them UNESCO World Heritage status, and Heritage Expeditions appropriately refers to them as the ‘Galapagos of the Southern Ocean’. Charles Darwin was openly unimpressed with what he saw of mainland New Zealand during his fleeting visit in 1835. Perhaps, if he had been able to venture further south during his long voyage of discovery, he would have found more than enough birds, beasts and other biota to whet his insatiable appetite for natural wonder. *Information from Heritage Expeditions website.